So when you signed on to follow Kim's amazing serious, Favorite Rooms, did you ever think you'd get a double dose of the Picket Fence girls?! I'm so excited to be here today sharing my favorite room with you and would it be a surprise (since we seem to share the same brain) that, like Vanessa's favorite room, my favorite room is my new Master Bedroom? In our last home, our master bedroom was the most neglected room in the house. After spending months remodeling our kitchen, dining room, hallway and bathrooms, there just didn't seem to the the funds or time to pay much attention to the master bedroom. When we moved to our new home, eight months ago, I vowed that this time around I would have a sanctuary where I could retreat to. A room that made me smile when I snuggled in for the evening with a good book and some hot tea. The first purchase I made, before we even had a sofa to sit on was my button tufted ivory headboard! I fell in love with it when I saw it online and had to have it for my bedroom. It was even more beautiful in person and you won't believe where I purchased it! But as a hint it has the initials W. M. ;) My next purchase was my beautiful comforter set from Pottery Barn. I was craving for a calm and serene color palette made up mostly of whites and creams, but I knew it would need some pops of color. This set, I found on clearance, fit the bill with it's blue, terra cotta and touches of yellow. I love to have lots of storage space in a room and using two chests of drawers, that were located in other rooms at our prior home, fit the bill for nightstands! I wasn't sure how I felt about the mismatched pieces at first, but I've really grown to love them and they and a "decorated over time" feel to the room. I think every master bedroom needs a place to sit, and this leather chair worked perfectly in this corner. I replaced the red shade on the floor lamp with this pretty gold one I found at a close-out sale. Another thing I love to do in our bedroom is surround ourselves with some of our favorite family photos like this collection of photos of my sweet babies. 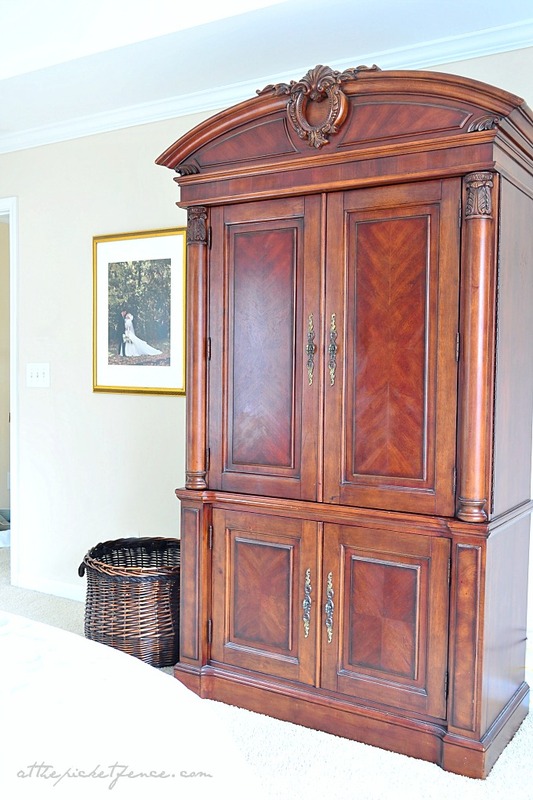 The armoire holds our TV, which truly makes this a retreat when our teen and college age children are monopolizing the other TV's in the house. My husband I love to come up here with a glass of wine and some snacks and watch our favorite movies, away from the hustle and bustle in the rest of the house. One of my biggest pet peeves in a room is not having a place to store bed pillows, or the pillow puzzle as my husband calls it. ;) I found this large basket at Ross for under $15.00 and is such a great alternative to tripping over piles of pillows in the night. When Lee and I were married our photographer had this large portrait made of us for their advertisement. Years later I was able to purchase it from them and I love to have it in our room to remind us everyday how far we've come together. I love to hang it on my husband's side of the room to remind him when he wakes up every morning how much he loves me. ;) I'm still working on finishing up this space, aren't rooms always a work in progress? These are a few of the areas I would love to get completed. I am wanting to place something under our wedding photo. Maybe a bench? or a small desk? I also need something above my bed that won't clash with the mirrors. It's a narrow space. I know Kim's readers are so talented! Any thoughts on what you would do? 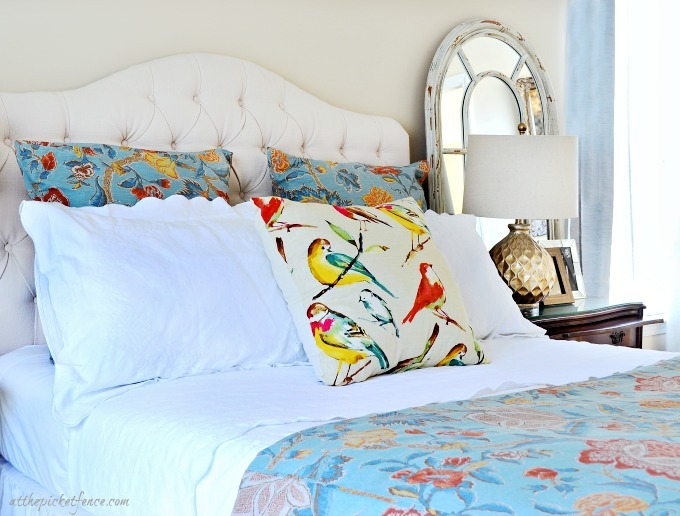 Thank you so much for taking a walk through my Master Bedroom retreat and a BIG THANK YOU to Kim for having me here today to share....my favorite room! Heather, I really love your bright and colorful bedroom. Thanks so much for sharing your favorite room with us. Don't y'all love this room. If you aren't familiar with the Picket Fence girls please go over and visit their blog. You can catch up on all the past favorite rooms here. I can't believe it's been 8 months aleady Heather! the room is coming together beautifully. Oh Heather...your bedroom is so very romantic with a incredible sentimental feeling of things you love and treasure. So happy that you are settling into your new home and new area so well as you can see it in your passion of making your new house a beautiful home for you and your family. Love that bedding. . I have a very similar pattern of PB "Vanessa"....Super feature Kim!...Have a wonderful weekend Kim and Heather! What a cheery and bright bedroom. I too luv the collected look of a room. I think it gives the room soul, no? Beautiful feature Kim. Thanks for letting us peek into your favourite room Heather. Luv it! Very happy room. Love your beautiful portrait. I have ours in the bedroom too. What a lovely room, it's full of great light and I love the color palette. Those pretty arched mirrors are gorgeous and the bedding is beautiful. Wonderful job Heather! :) Thanks for sharing. 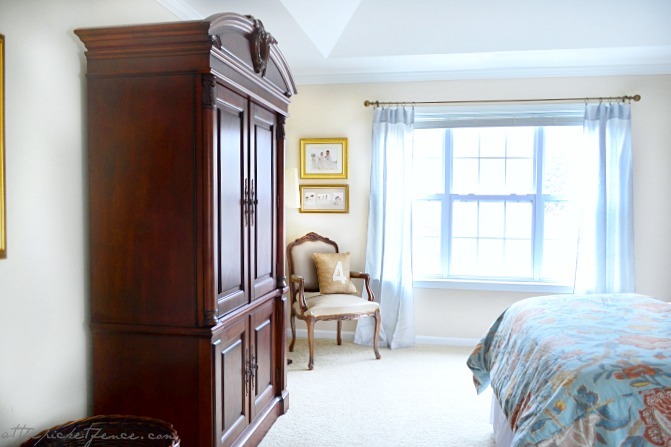 Beautiful room,,,love the armoire. As for what to put above your bed....what about your initials...simple block letters, I don't think they would compete with those gorgeous mirrors. Beautiful, restful room. I love the bedside table arrangement with mirrors especially. Heather, not only do I love you... but your beautiful bedroom too! The headboard from W------ is amazing! What a great buy! I never thought to look there. Now I will! After I saw your wedding picture, everything else paled in comparison! What a gorgeous bride you were!!!! Kim, Vanessa and Heather (and of course you) are one of my very favorite bloggers! They are so near and dear to my heart! I almost feel like they are my daughters! Thanks for featuring them! Wow, what a beautiful bedroom. It's so bright and airy. Looks like a wonderful place to retreat at the end of the day. You wedding photo however is just stunning. That was a great addition to your room. 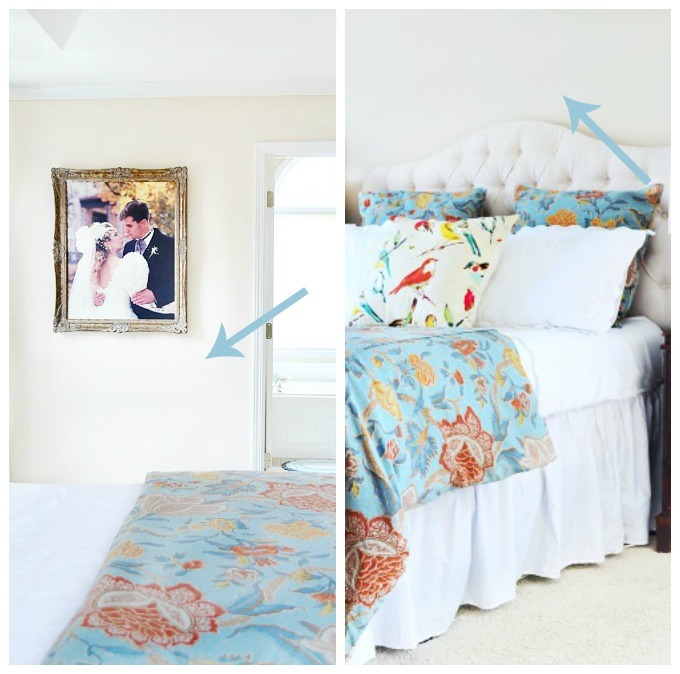 Heather you created a beautiful space...love your headboard and love that pretty bedding!! I have the same duvet from PB in a different color. A pretty chest or desk would look great under you wedding photo but I think your bed wall looks perfect as is...Love those mirrors you have on your nightstands! What a lovely and peaceful room....looks so pretty! This is beautiful retreat you've made for yourselves. 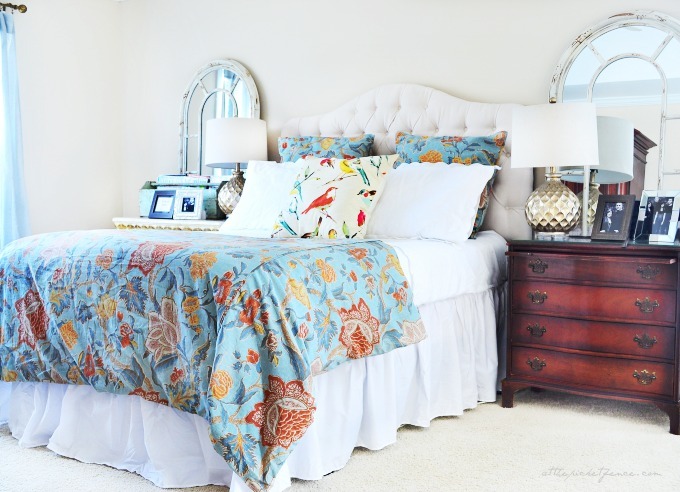 I really love the mirror behine the nightstands and that tufted headboards is gorgeous. What a wonderful bedroom! The perfect cozy nest. 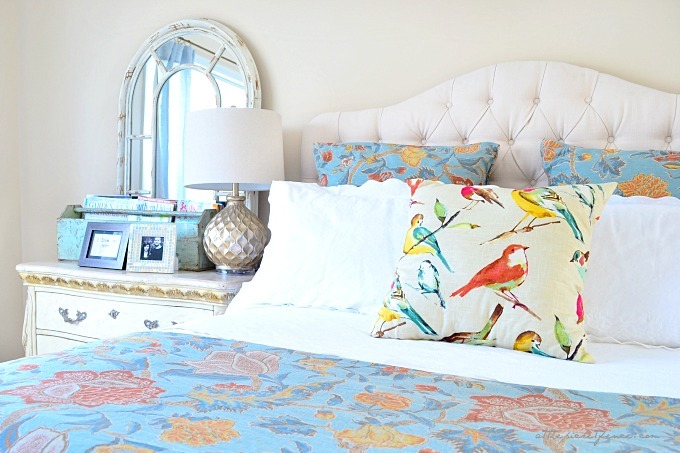 Such a pretty, cheerful room! Heather, I have been searching for a headboard for our guest room. So pleased to see yours, just what I wanted. I ordered it after reading all the positive comments. Heather's bedroom is just beautiful even if she is still working on it! I love her pretty bedding and the idea of a pillow basket. So stealing, oops borrowing, that idea for our bedroom. My hubby will be thrilled to have a place for them at night! Thank you so much for sharing Heather and Kim. Wishing you both a great weekend! Heather, your master is BEAUTIFUL! 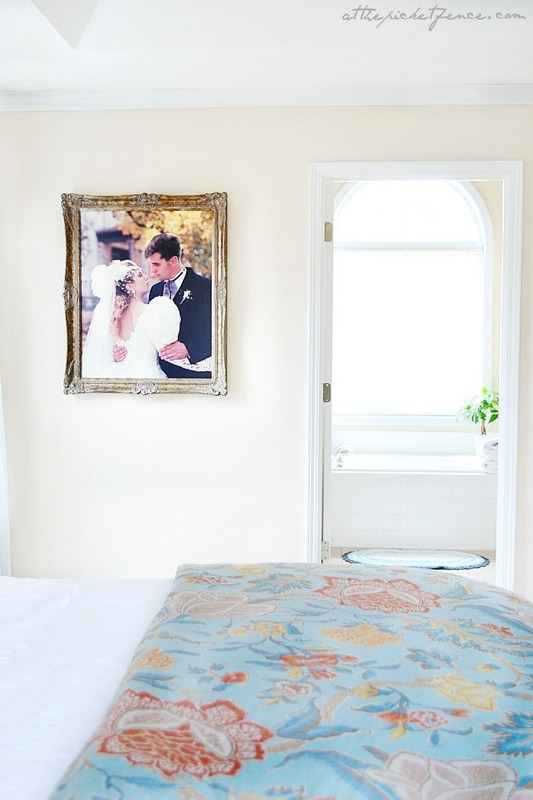 I love, LOVE your wedding portrait! Above the bed I could see a beautiful architectural piece, but nothing too big. Wish I had an armoire like that, just beautiful. The headboard came from W???????????? OMG!!! I am going to their site right now! Hope you all have a GREAT weekend. Thanks for another great feature, Kim. Oh my gosh! My brain just was not working and I could not think where you could have purchased your headboard until.......I saw and clicked on the link! Wow! I had no idea they carried tufted headboards! It's beautiful in your room along with those gorgeous mirrors above your nightstands. Frankly, I just wouldn't put anything additional above the headboard to compete with what you already have. I can see a little narrow table under your wedding portrait-a place to put the bottle of wine! :) Your bedroom exudes your warm personality, Heather. Love you and Vanessa to death! Thanks, Kim, for featuring Heather's favorite room! such a gorgeous room! LOVE those amazing matching mirrors! What a beautiful room, Heather! 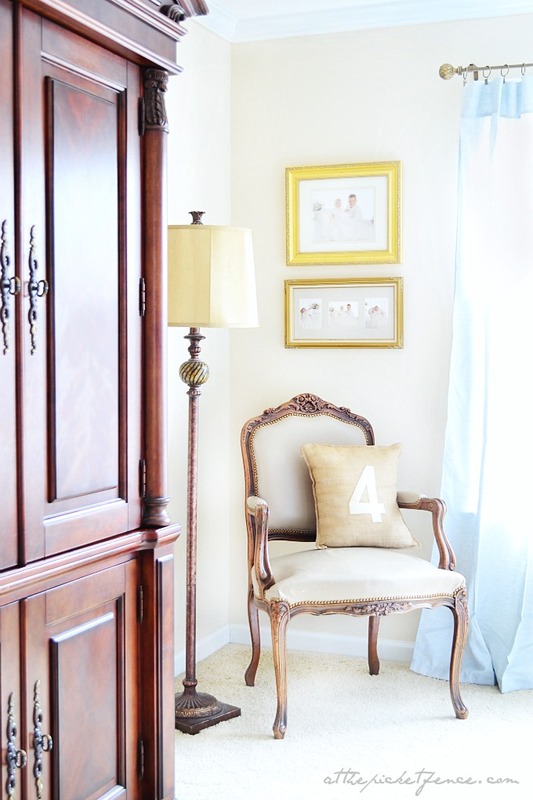 I love everything about it, the armoire is just stunning and I love that leather chair. It is awesome! Heather what a beautiful room. So cheerful and gorgeous. I love your wedding picture just so romantic and pretty. Wonderful fav room. Heather, thanks for sharing your beautiful master. What a lovely space! Heather's room is very pretty! I like the matching arched mirrors on each side of the bed. I recognize that style wedding veil she wore in her wedding photo too. LOL! Mine was very similar. She must've gotten married in the 80's like I did. Beautiful room for a beautiful person! Heather it is a very pretty room. Although I think the headboard is lost on the white wall...a soft blush of color would help give it more prominence. The lamps should be moved to the center of your night stands.....they are a little too large and too close to the bed and makes the it feel heavy....too many photographs make it look cluttered and hide those beautiful mirrors. a total of 5 objects two of the same and three different objects at varying heights would be more pleasing to the eye. A table under the wedding photo would compliment those beautiful family photos. Nothing over the bed as it doesn't appear to have much wall space from the headboard to the ceiling....I would also hang your drapery higher over the window about two inches below the ceiling....you could use a coordinating fabric by adding it to the bottom to lengthen the drapery. A nice creamy white fluffy pillow (I call it Angel Hair fabric) would be lovely in the leather chair. If it were me...a very pale blue on the wall behind the bed would work...or even a little darker white.....in a satin paint to give it a touch of glimmer...I would also actually change the lamps to something smaller for task lighting (or reading)...then add two matching chandelier's over each mirror. The bedding is beautiful....I would carry the colors.in the bathroom using the colors in the bedding for inspiration. Lovely room! Heather, I wouldn't hang anything above the headboard. And I can totally see a little table under your wedding portrait. I'm in LOVE with that basket. ( I get excited over the details.) And if my husband weren't asleep right now, I'd go pull my wedding portrait out from under my bed and hang it up right now. It's on my to-do list for first thing in the morning. Thanks for sharing, Kim and Heather! Heather, you've succeeded in creating a beautiful retreat! I think a bench under your portrait would look great, and I think that you don't need to put anything above the headboard, since you have large mirrors along side it. It stands out this way as the star, as it should, because it is so pretty. Heather your bedroom is so beautiful,love your bedding.And your furniture is gorgeous!